The first Glengarry Highland Games were created in 1948 by a small group of local businessmen who wanted to ensure that the Scottish traditions would not be lost by the younger generations. To their surprise, their little event attracted close to 10,000 people who flooded the small farming community of Maxville. As they say, the rest is history. In 1948, when the first Games organizers decided to revive the traditional sporting and cultural events of their Scottish ancestors, little did they think that over 70 years later, tens of thousands would still be trekking to Maxville on the long summer holiday weekend. Eight pipe bands competed at the first Glengarry Highland Games in 1948 and today, the Games can boast of hosting the largest massed pipe bands in North America with bands that have numbered over seventy. The Games have grown over the years to add more events in Piping, Heavyweights and Dancing. To be sure the Games are one of the premier stops each summer for Scottish competitors. Highland Dancing has also seen a growth in numbers and events over the years. There are now between two and three hundred competitors. The Massed Highland Fling at the Official Opening was first held in 1962. A number of champion dancers have competed in Glengarry over the years. Peter Daniel was here from Australia and world champion, Garth Mitchelson from Scotland, won his class here in 1988. With the interest and growth of violin teachers in the area, the participation of fiddlers at the Games became more and more prominent. The Glengarry Games is synonymous with massed fiddlers who participate each year in the Scottish fiddle venue. The Heavyweight Competition continues to be a crowd favorite. Over the years, names that stand out are Dave Harrington from Quebec, along with Warren Trask who in 1993, set a world record in the sheaf toss, and Harry MacDonald, the youngest man to win his heavyweight class. The Children’s Mini Games had its beginning in 1991. Recently a Women’s Heavyweight Competition has become popular along with the Amateur and Masters’ divisions. 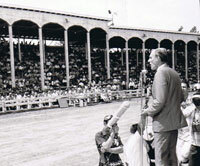 A number of new buildings and another grandstand have been built over the years to provide seating and facilities for our thousands of guests. As well, the Games are proud to have had many Canadian Prime Ministers, other government officials and sports celebrities act as our guests of honour to “open” the Games. Be part of history and join us in Maxville on long weekend at the beginning of August for a special time at one of Ontario’s Top 100 Festivals and one of the largest celtic events in North America.